Enabling proper 2D subtitles to be shown while playing a 3D video with the 3D Vision Video Player (or the Stereoscopic Player) may sound easy for some people, but it seems that much more have trouble setting this up properly, so here is a quick and up to date guide on how to do it. What you need first is to download the latest version of the 3D Vision Video Player or the Stereoscopic Player and the latest version of the ffdshow filter/decoder pack. 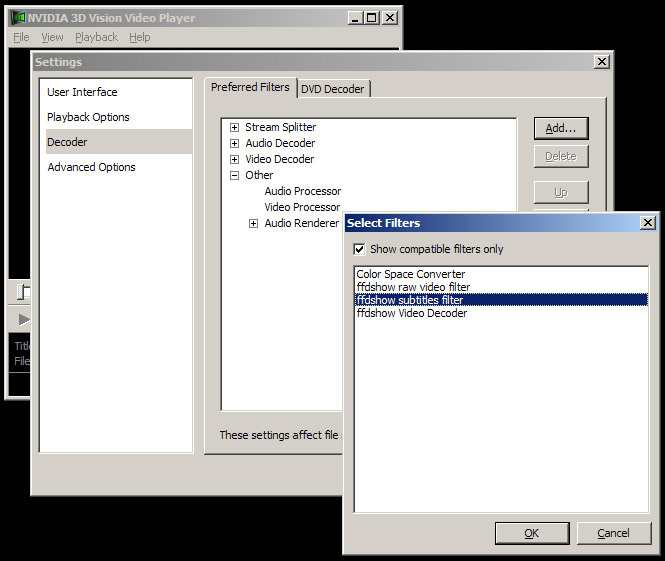 Start the 3D Vision Video Player, go to the File menu and select the the Settings option from there. Click on the Decoder setting and extend the list called Other, select the Video Processor option and click on the Add button. From the list with filters you will see in a new window you need to select the ffdshow subtitles filter and click on the Ok button. At this point you are halfway there, you’ve told the player to load the DirectShow subtitles filter when you play a video, but there are some more things still left to be done in order for everything to start working as you want it and for you to see the subtitles. 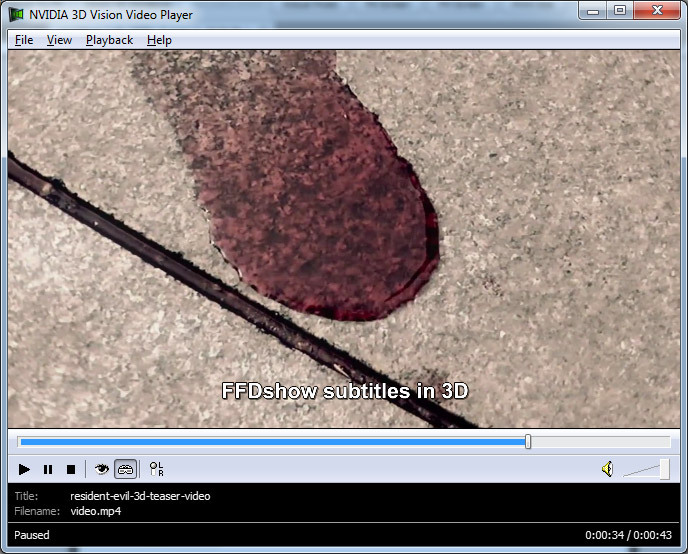 Now you need to open a video file with the 3D Vision Video Player in order for the subtitles filter to be loaded, so that you can configure it to display subtitles in 3D properly. You don’t need to open a 3D video with subtitles at this point as you will only be configuring the filter, so open the video and hit the pause button, then look in the system tray at the lower right end of the monitor for a small square red icon with the text FFV on it (you may have multiple of these, not just one, if the video is also being decoded with ffdshow). When you move the mouse cursor over these icons you will see a balloon with information, just do a double left click on the one that says ffdshow subtitles filter and you should see a configuration menu like the one above. 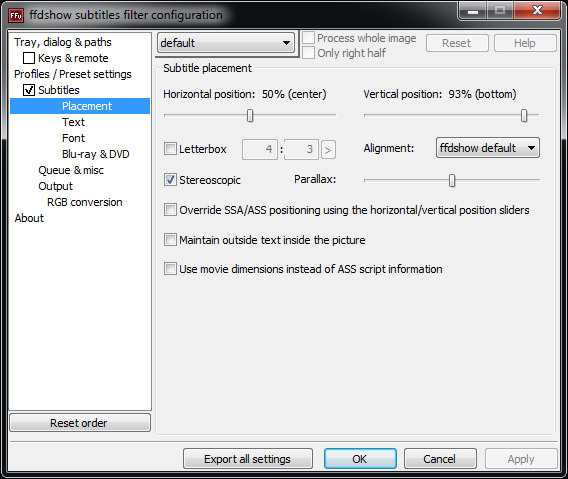 When you see the ffdhsow subtitles filter configuration menu you need to put a tick in the box before Subtitles in the left menu, so that you will actually activate the filter to show the subtitles and then click on the Placement menu and put a tick in the checkbox in front of the Stereoscopic option, this will make the subtitles show in both the left and right eye frames, so that they will look properly. That is pretty much all you need to do in order to make the 2D subtitles work and display properly over a 3D video, you can play with the other options if you wish to customize the way the subtitles are being shown. By default the subtitles are shown at screen depth (zero parallax), but with the help of the Parallax slider you can make them appear inside the screen or outside of it, however you should not be playing with this if you don’t know what you are doing to prevent yourself from making the subtitles unintentionally harder to read. Just leave them with the default zero parallax, it should work just fine with 95% of the cases and change the subtitles parallax only if a specific movie needs it. Now you can just open the 3D video file with the 3D Vision Video Player like you do normally and if you have subtitles with the same name as the video file (video.mp4 for example) and a proper text format such as SRT (video.srt for example) in the same folder of the video file they will be loaded automatically and displayed on the screen over the video. If you still don’t see the subtitles, they go back and check if you’ve done everything in the guide properly. Very similar alternative solution is to activate the Subtitles from the ffdshow decoder configuration, however this will be active only when you are using ffdshow for decoding the video. By using the method described above with the ffdhsow subtitles filter you can use different video decoder and still have the subtitles shown, so the use of the external DirectShow subtitles filter is the more flexible solution.